At this time of the year, most of us get all reflective, then hopefully motivated.But we have to emerge from our festive stupor first. Of course, yoga can help. Turn to certain yoga postures to help get set for a fresh new year of exciting new goals, and dare I use the ‘R’ word—resolutions. Mine are to do yoga every day (even just a few gentle postures or some conscious breathing) and to make ‘breathe’ my word for the year—I figure we’ve got to keep on breathing, so I may as well be more aware of what I’m doing. So, ready to snap you out of that post-indulgence slump from too much turkey and that extra eggnog, and get energetic and crystal-clear about the sort of New Year you want? Here are some ideas for yoga to get you set for the New Year. 1. 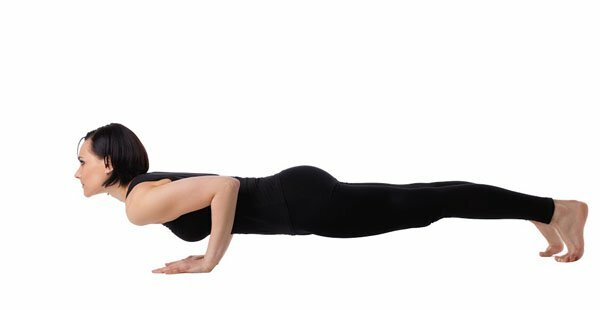 Get pumped with Chaturanga Dandasana, Uttanasana, and Plank. Savasana isn’t going to cut it. A fast Vinyasa flow will get the heart racing and blood moving. Add a double Chaturanga Dandasana (Four-Limed Staff Pose aka The Yoga Push-Up) into your flow, and jump back between Uttanasana (Forward Fold) and Plank if this is available in your practice. In yoga teacher training, we learned to incorporate a ‘power move’ to achieve an instant state change. Your jumping-up-and-down-while-pulling-a-funny-face move might feel a bit silly, but it will get your nervous system ready for heightened energy flow. Notice how great you feel after. 2. Ground yourself with Warrior II. Strike the pose of the warrior. Warrior II is a perfect balance between maintaining a connection to the past with a strong intention for the future. Balancing your weight in the middle will ground you in the present as your back leg and back arm provide a firm anchor to the past (i.e. reflection). Your strongly bent front leg and outstretched front arm coupled with a fixed gaze (drishti) over the middle finger of your front hand dares you to move forward with confidence. Here, you get to harness the lessons of the past, with the awareness to move with focus into the future. 3. Gain clarity with Forward Fold. Be it with Uttanasana or a Wide-Legged Forward Bend, getting and keeping your head below your heart is going to calm your nervous system. You can suddenly breathe and think again, right? Blood will rush to your head, bringing clarity with it. This rush of blood will be a nice ‘facelift,’ helping you to put your best face forward in the new year. If you can get the crown of the head to the floor, then you are set up for a Headstand—all inversions will help you embrace change as you literally see the world from upside down. There is no more radical new perspective to take into the New Year. 4. See the big picture with Spinal Twist. Spinal Twist—not recommended if you had that second serve of dessert, but great for twisting out the toxins from too much sugar, fat, and (dare I admit it) alcohol. It’s the perspective shift of a twist that is often overlooked as we focus on wringing our insides out like a sponge. 5. Let go of the past with Wind-Relieving Pose. If a twisting compression posture is a bit much, Wind-Relieving Pose, done either on its own or as a lead up to a twist gently compresses into the digestive system, helping your body process all that festive cheer, hopefully without an embarrassing release of air. If it happens, though, it happens, and hey, that’s the past you’re letting go of! Yoga for me is a constant comfort that I take from year to year, an amazing journey of growth that always feels fresh and new—truly Yin and Yang. In 2014, I qualified as a yoga teacher, and 2015 has been a completely transformative experience. Who knows what 2016 holds? If you’re like me, it will be a whole lot of fun finding out, and yoga is a great place to start your quest!